This is a series of articles celebrating our volunteers and all the work they do for, and with, Historic Rugby! The Rugby Printing Works building (known as the Print Shop) sits in the center of town next to the Harrow Road Cafe and initially draws visitors’ interest due to its highly decorative wooden exterior. But, they would not be able to go inside it were it not for the efforts of two volunteers to see it opened and interpreted during high traffic weekends. Thanks to Carolyn and Julian Bankston, and other trained volunteers, visitors are now able to go inside the Print Shop and learn about its history and function during weekends when other Historic Rugby buildings are open! 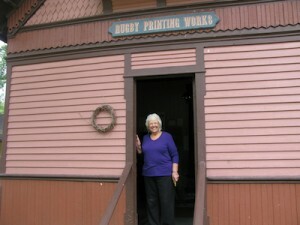 The idea to staff the Print Shop with volunteers came to Carolyn (pictured in second photo) over time as she watched many visitors go up to the Print Shop and peer into the windows, frustrated to find the building closed. In fact, up until then the Print Shop was only open for interpretation during special events such as Rugby’s Spring Festival with the long time volunteer help of Walter Clements and Gerald Hanwright. Julian and Carolyn worked with administration and began to open the Print Shop free to the public in the early months of 2012. But, they soon realized they could not do it alone so they started looking for volunteer assistance. Gerald Hanwright conducted a workshop for five volunteers to learn the basics of printing. Other folks not trained on the equipment were recruited to help with historical interpretation. One of the Print Shop’s most committed volunteers is Peter Merrill from Crossville. He was visiting Rugby shortly after the volunteers began opening the Print Shop, but because it was mid-week the shop was closed. Luckily, Donna Heffner, a local shopkeeper saw him looking through the window of the shop and opened the door for him to go in. Peter‘s love of printing began early in his life. He says he “majored in printing in high school” as out of six periods a day he was in the print shop for three of them for four straight years! In 1985 he and his wife bought a commercial printing company and ran it for five years. They eventually moved to Fairfield Glade and happened to hear about Rugby from his visiting brother who had been touring the area. His brother told him “you have got to go up to Historic Rugby and see the print shop they have there!”. He now comes up from Fairfield Glade almost every Saturday and volunteers at the Print Shop. We thank Peter, and all the many dedicated volunteers who have helped with this project! 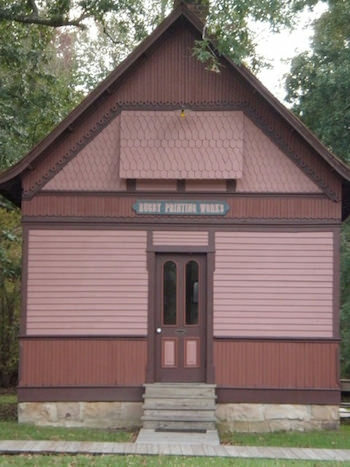 The Print Shop is not original to Rugby but was built in nearby Deer Lodge in 1887. It was brought over to Rugby in 1978. Although none of the printing equipment is original to the Rugby Print Shop, it is from the same era. The volunteer interpreters describe the early history of the Rugby Printing Works and how the printing equipment was used to our visitors. This distinctive building is not original to Rugby, but Rugby did indeed have a print shop located east of the Gibson cottage (now The Painted Rooster). It is the subject of ongoing research. One of the most surprising things Julian and Carolyn found after opening the Print Shop was how many long time visitors to Rugby had never had an opportunity to visit it before. Visitors have responded enthusiastically to the new interpretive experience. Many come back and bring guests with them to tour the Rugby Printing Works shop! Thanks to the Print Shop volunteers someone will be there to interpret the fascinating history of this little building! The Print Shop is open on Saturdays from 10 a.m. until 4 p.m. and on Sundays from 1:00 p.m.until 4 p.m. during the season that Historic Rugby buildings are open. It is also open during special events such as Ghostly Gathering and Christmas at Rugby. 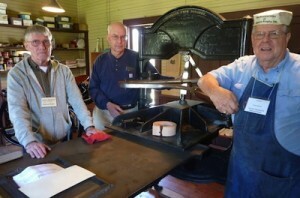 Photo at right: Volunteers Julian Bankston (left), Walter Clements and Peter Merrill in the Print Shop.